Preparing for a role, especially one that is based on a real person, sometimes means spending a lot of time with that person, literally or metaphorically, and getting to know everything about them. 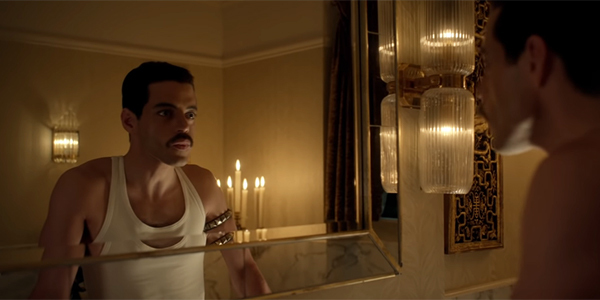 Rami Malek prepared for a year to inhabit Freddie Mercury in Bohemian Rhapsody. He studied him, learned his movements, wore false teeth, and had a strict diet and exercise regimen to become the Queen singer and do him justice. During that time he apparently fell in love with the late singer he was portraying, perhaps gaining a deeper level of appreciation and affection than just being a die-hard Queen fan ever could. Rami Malek’s feelings about Freddie Mercury were also informed by how much he found he had in common with him. As an entertainer, albeit in a different industry, Malek knows the duality of having a public life and a private one, and as a fellow artist he can empathize with the struggles that Freddie Mercury went through – as he explained to The Hollywood Reporter. The Academy Award-nominee is surely currently on the roller coaster of emotions that comes with fame, and while he’s on a high point right now, he understands that, as it was for Freddie, sometimes there are a lot of obstacles in the way of one’s goals and happiness. So by learning about Freddie and seeing what they have in common, Rami Malek came to love the Queen frontman. That naturally made Queen members Brian May and Roger Taylor’s comments about their similarities the highest of compliments. While the star fell in love with Freddie Mercury, a whole lot of people fell in love with him thanks to his performance in Bohemian Rhapsody. The music biopic has become an international phenomenon, making over $833 million worldwide – and despite lukewarm reviews, most critics agree on how great Rami Malek is in the role. The actor’s transformative performance has already netted him Best Leading Actor wins at the SAG Awards, the Golden Globe Awards, and the BAFTAs. He goes for the big prize on February 24th at the 91st Academy Awards, where Bohemian Rhapsody is nominated in five categories, including Best Actor for Rami Malek and Best Picture.